Log in as an administrator and run the Popup installer to install Popup on your Mac OS X computers. Note: Depending on your security settings, you might be required to press the Control key and click your mouse at the same time (or right-click) and select "Open" from the quick menu. 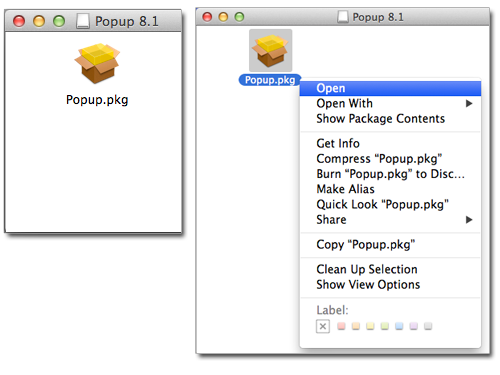 On each computer, use the Mac OS X Printer Setup Utility to add Popup printer queues. Obtain the file Popup.dmg from Pharos Systems. Double-click this file to create a new disk image in Finder. This disk contains the Popup 8.1 installer, Popup.pkg. Click Install (or Upgrade). The installer automatically installs Popup 8.1 and required support files. Pharos Popup will now be running on the computer and will be automatically launched every time a user logs in.